Commercial buildings account for a large percentage of global energy consumption. Most of the electricity consumed goes toward lighting (typically 30-50%) and heating, ventilation, and cooling (HVAC) systems (an additional 30-60%). 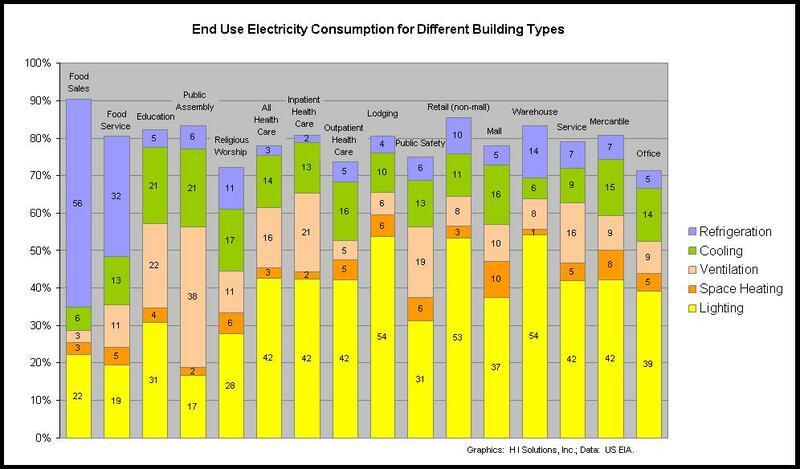 This chart, based on newly-released data from the Energy Information Administration (www.eia.doe.gov ), indicates the amount of electricity used for different purposes in various types of buildings, as a percentage of total electricity use. Lighting, HVAC, and refrigeration together account for 70-90% of a building's electricity consumption. The remainder includes electricity for operating office equipment, computers, heating water, or cooking among other uses. The good news is that the large electricity consumers, lighting, HVAC, and refrigeration, are all controllable. The best way to reduce electricity costs for a building is to monitor and control these systems using a building automation / energy management system. H I Solutions offers integrated, customized products to reduce the costs and carbon emissions associated with high electricity consumption.